UMass Lowell Libraries in partnership with the Tewksbury Museum of Public Health has nearly completed the first phase of a project to digitize intake records from the Tewksbury Almshouse. Funding for this project was provided through a Library Services and Technology (LSTA) grant from the Institute of Museum and Library Services (IMLS) awarded by the Massachusetts Board of Library Commissioners (MBLC). In this first phase nearly 20,000 pages were scanned from the original ledgers representing over 23,000 individual intake records that were created by the almshouse and currently preserved at the Museum of Public Health. 20,000 of these records, dating primarily from 1873 to 1884, have so far been ingested into a new Omeka repository established this summer by UMass Lowell Libraries. Also included in this initial ingest are 50 records from 1854, when the almshouse first opened, to 1872. These records are the only ones existing in their original ledger format from those early years. These initial records consist of hand-written notes taken during a patient’s intake interview. Many of these are lengthy detailed narratives that cover the person’s full life history, focusing on family relations, work, and health. 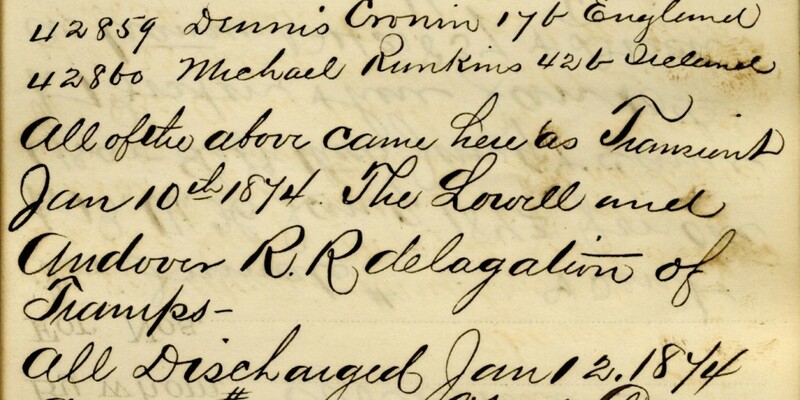 Besides the ledgers kept at the almshouse, a second set of duplicate records were transcribed and sent to the state and saved by the Massachusetts State Archives. These records were eventually microfilmed and the originals destroyed because of water damage and mold. For this project five of the earliest microfilm reels were digitized covering the years from 1860 to 1873. These records provide another estimated 15,000 intake interviews. Very few records survived prior to 1860. When this first phase of the project is complete a total of nearly 40,000 intake interviews will be made available in the UMass Lowell repository. Future phases of the project will add records through the 1890s. The description metadata includes patient name, age, gender, and birthplace. The records can be searched by each of these fields or in combination using advanced search. For example, 674 records indicate birth at the Tewksbury Almshouse. In addition, the relation field is populated in nearly 3,000 records with the intake numbers of associated records. For example, the relation field for the record of a birth at the almshouse lists the mother’s intake number while her record likewise lists her baby’s intake number. These relationships are not fully apparent in the ledger narratives. Although the mother’s first name and intake number is included in the child’s birth notice, the mother’s intake record ordinarily does not explicitly mention that she is pregnant, so by reading her intake interview one might never know that she came there to give birth. Another addition to the metadata is the inclusion of over 800 alias names. In some cases intake records note as many as four or five alternative names for some individuals. These names have been added as subject entries. Furthermore, keyword tags have also been added to over 500 records to indicate conditions such as “foundling” (19) or “insane” (140). A keyword search for insane, for example, returns over 150 names, mostly women, in lists of patients who were transferred to or from the various state lunatic hospitals. 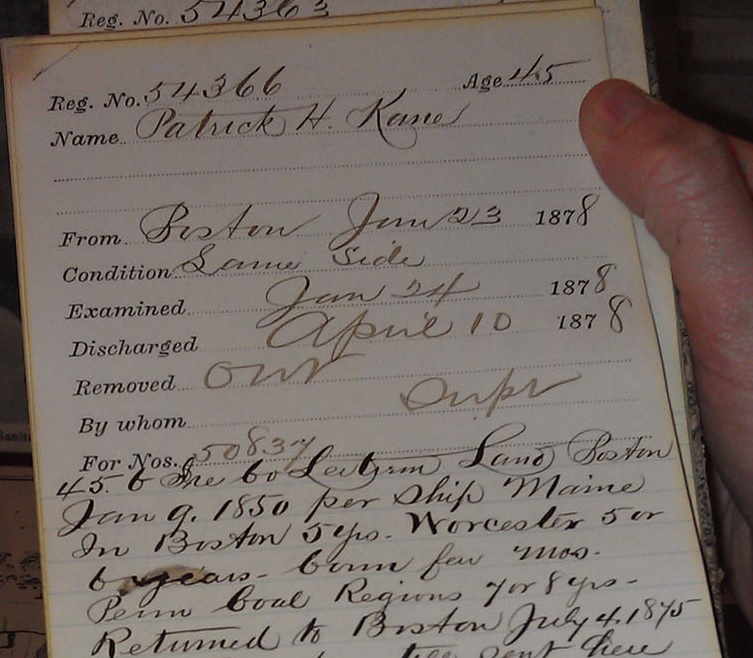 Foundling records, on the other hand, tell the heart-wrenching stories of abandoned babies. Eventually more of these keyword tags will be added by means of a crowd-sourcing customization added to the repository. The plan is to have selected students at UMass Lowell begin working on this next year. 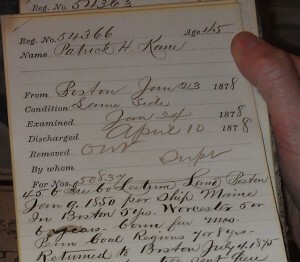 To view these records and search for others, please visit the UMass Lowell Digital Initiatives repository at http://libhost.uml.edu/collections/show/5, and perhaps discover a family story of your own. Ordinary People: In and Out of Poverty in the Gilded Age. David Wagner explores the lives of poor people during the three decades after the Civil War, using a unique treasure of biographies of people who were (at one point in time) inmates in a large almshouse, combined with genealogical and other official records to follow their later lives. Ordinary People develops a more fluid picture of “poverty” as people’s lives change over the course of time. The voices of the inmates of the infamous Massachusetts State Almshouse at Tewksbury resonate in remarkable ways today, helping us to understand that many individuals living in poverty make inventive, bold moves to escape it.